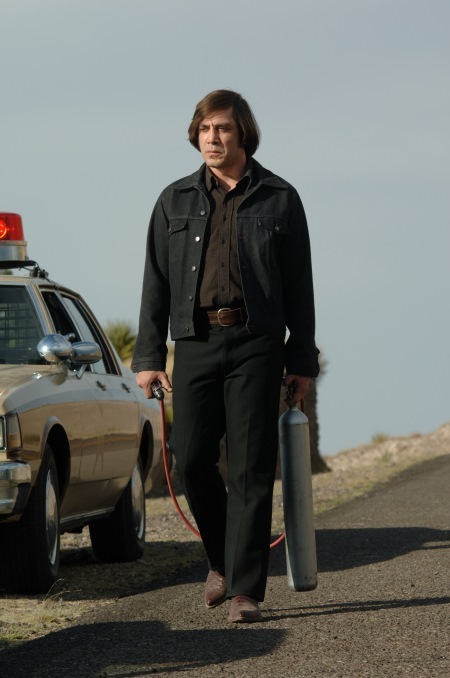 On October 6, 2007, No Country for Old Men played in the U.S. for the first time. The buzz had begun at the Cannes Film Festival a few months earlier, and anticipation was high. It went on to win Best Picture at the Oscars, surprising some by winning over Paul Thomas Anderson’s There Will Be Blood and Tony Gilroy’s Michael Clayton; the Coens won the Best Directing award and the Oscar for Best Adapted Screenplay; and Javier Bardem won Best Supporting Actor. 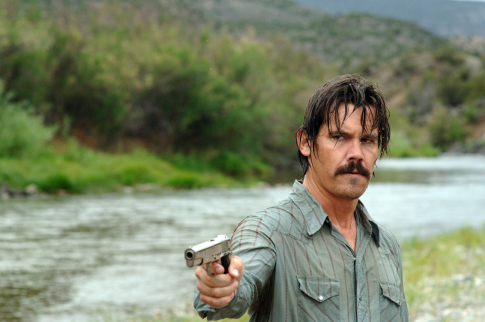 Llewelyn (Josh Brolin) tries to “stop what’s comin'” with a firearm. Bad idea. Meanwhile, my first draft of this review, which was published at Christianity Today, inspired waves of angry mail from readers who thought that a Christian should have no business giving any attention to a film as troubling and violent as this one. This review has been slightly revised, but only to include a few lightly spoiler-ish comments about the conclusion. Today, No Country remains the only Coen Brothers movie to win Best Picture at the Oscars. Barton Fink took the top award at Cannes many years earlier. And yet, those films are rarely ever named as moviegoers’ favorite Coen Brothers film. What’s your favorite Coen Brothers film? Can you think of any other novels that seem like great material for the Coens to adapt? As Sheriff Ed Tom Bell stares out at the barren Texas landscape, wondering how to catch a crazed killer, we can feel his deepening despair. As bodies pile up, and the maniac slips away, how can Bell hope to bring about anything that resembles justice in this situation? But those familiar with the author of this story will probably guess that God is not likely to show up onscreen and save the day like the cavalry. Instead, we’re shown a world full of foolish and greedy men, heartless killers, doomed innocents. Welcome to the World According to Cormac McCarthy. The story — which gets its title from William Butler Yeats’s “Sailing to Byzantium” — is about a Vietnam vet named Llewellyn Moss who finds $2 million at the scene of a drug deal gone wrong. Like an idiot, Moss takes the money and runs. But he can’t hide from the killer that the dealers have sent after him. Anton Chigurh is a ruthless predator who really enjoys his work. He’s so bad, in fact, that even his employers are frantic to stop him when they realize the trouble they’ve set in motion. There’s something very familiar about the madness that ensues in McCarthy’s page-turner. The numbskull thief. The apocalyptic killer. The exaggerated dialects. It all sounds suspiciously like the work of the Coen Brothers, who brought us violent crime capers like Blood Simple and Fargo. In fact, reading the book, this reviewer could not help but laugh at how conversations between the foolish thief and his oblivious wife resembled the bone-headed banter between Nicolas Cage and Holly Hunter in the Coens’ comedy Raising Arizona. So it’s almost too good to be true that the Coen Brothers have, in fact, adapted McCarthy’s novel and brought it to the screen. It’s as if this was part of McCarthy’s plan all along. Sweetening the deal, Tommy Lee Jones has been cast as Sheriff Ed Tom Bell. The Coens’ greatest strength has always been their flair for comical dialogue and exaggerated dialects. Their language comes as naturally to Jones as riding a horse. He savors and spits his lines as if they were chewing tobacco. He has the gaze of a lifelong farmer who hasn’t seen a drop of rain in a decade, and his face is as rugged as the Texas landscape. He captures the book’s portrayal of Bell — a man caught in the quicksand of despair — perfectly. 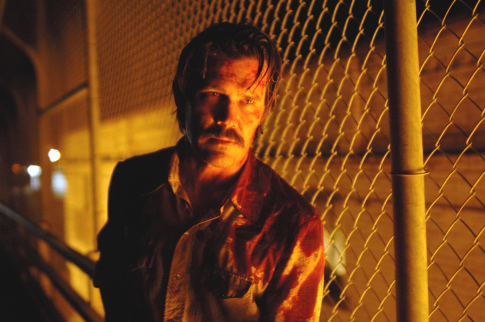 Jones has played a lot of troubled trackers in his career, and chased a lot of fugitives. But his work here is second only to his performance in last year’s The Three Burials of Melquiades Estrada. The rest of the cast, with one exception, is note-perfect. Kelly Macdonald, known for her fragile beauty and Scottish accent, is startling as a trailer-bound housewife with a Southern drawl thick as molasses. Woody Harrelson plays a boastful hitman named Bell to perfection, just two steps up the ladder of idiocy from Moss. Only Beth Grant seems out of place, overplaying Moss’s mother-in-law as if she was acting in a sketch on Saturday Night Live. But everybody will leave the theater raving about Javier Bardem, who plays the sinister slaughterer. There’s a wild light in Chigurh’s eyes and even a hint of a smile as he torments his soon-to-be-victims. Looking like the worst descendant of the Addams Family, he’s a fearsome freak, as unstoppable as those black thunderstorms we see sweeping across the desert. The scenes in which Chigurh stalks Moss are as suspenseful as anything the Coens have ever staged. And that has as much to do with what we hear as what we see. No Country for Old Men lacks a traditional soundtrack, but don’t say it doesn’t have music. The blip-blip-blip of a transponder becomes as frightening as the famous theme from Jaws. The sound of footsteps on the hardwood floors of a hotel hallway are as ominous as the drums of war. When the leather of a briefcase squeaks against the metal of a ventilation shaft, you’ll cringe, and the distant echo of a telephone ringing in a hotel lobby will jangle your nerves. In spite of masterful sound design, and brilliant cinematography by Roger Deakins (who also shot The Assassination of Jesse James by the Coward Robert Ford), it’s what we don’t hear or see that makes No Country so haunting. Love, hope, and Almighty God — they seem to be missing in action. God just might not exist at all. Powerfully faithful to the McCarthy’s text, the Coens have given us their bleakest work to date. At first it feels like familiar territory, with numerous references to their previous works. Like Raising Arizona‘s “Lone Biker of the Apocalypse,” Chigurh happily blasts small animals with a shotgun as he roars down the highway. The guilty and the innocent try to talk their way out of execution, just as they did in Miller’s Crossing. Stephen Root (TV’s Newsradio), who made the Soggy Bottom Boys a recording sensation in O Brother, Where Art Thou?, plays the everpresent Coen Brothers caricature: The Man Behind the Big Desk. And Sheriff Bell, world-weary as he is, might be related to Fargo‘s Marge Gunderson. And yet, in spite of these similarities, we’ve never seen the Coens descend so far into the abyss of human depravity. Their primary endeavor — from Blood Simple to Miller’s Crossing, from O Brother Where Art Thou? to The Big Lebowski — has always been to ask if the human heart might discover grace in a world spoiled by greed, murder, and folly. Mining the brittle stone of McCarthy’s nihilistic narrative, the Coens can’t find anything more than a trace of hope. Audiences are likely to be taken aback when No Country takes storytelling conventions and turns them upside down. We’re accustomed to the comfort of a story in which main characters guide us through the trouble and then look back on it at the end. But McCarthy’s purposes are more disruptive than most expect; he wants to remind us that we can’t take anything for granted in this world. Evil delights in making death seem meaningless, and the incidental nature of the murders in this film have angered more than a few reviewers. Still, isn’t that the way it happens? Every murder victim listed as a statistic in the newspaper was the main character of their own story. Do we ever stop to learn what that story was about, what narratives were interrupted by their abrupt and inexplicable deaths? And we’re left facing questions that haunt so many great works of art: Who is the world waiting on? If God exists, why doesn’t he intervene to prevent such apocalyptic violence? Whatever the answers might be, No Country for Old Men suggests that truth, justice, and the American way are not enough to save us from the dark and deadly winds of change. Is there anywhere we can go for help? What is that “trace of hope” I mentioned? It’s only a glimmer, a spark of light, and it’s waiting for us in a world beyond our own, in the darkness of a disillusioned lawman’s dream. This reminds me that I need to see No Country again, since the last time was when it was new. I’ve enjoyed all the Coen Brothers’ films, but my favorite is O Brother, Where Art Thou?, which for my money is the most fun movie ever–yes, ever. I have to go with O Brother, but I also love Fargo, Big Lebowski, Raising Arizona, Miller’s Crossing. I have to say that No Country is my favorite. There really isn’t anything I can think of that makes me feel as simultaneously wonderful and heartbroken as Cormac McCarthy’s words and certainly no one has put them to screen as well. It breaks my heart every time, but in the best possible way. I would love to see you review McCarthy’s book Blood Meridian at some point. It is just about one of the greatest books of American literature ever.